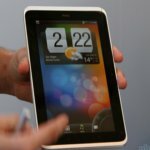 HTC’s Sense UI would not be as suitable on a tablet as on a cellphone. But still HTC have decided to launch the Flyer with their native Sense UI instead of waiting for a Honeycomb launch. They’ve made some tweaks to the UI though, so it’s not basically the UI one would see on a HTC handset.